AT&T Wireless today announced the mMode Music Store or what the company is calling, "The first-ever mobile music store in the US." The service ties in with Windows based personal computers to make the mobile phone a "Remote control" for music content. Songs may be previewed and purchased via AT&T Wireless mobile phones, but the actual songs are downloaded onto a personal computer. bq. With the AT&T Wireless mMode Music Store, customers can discover, browse, listen to and purchase digital music tracks from a library of approximately 750,000 songs -- all right from the handset. Built in cooperation with Loudeye and Microsoft, the mobile music store is seamlessly integrated with the PC, so digital music tracks are downloaded to users' Windows PCs and billed automatically to their monthly AT&T Wireless statement or credit card. Users of the mMode Music Store will feel right at home, feature wise it is similar to digital music leader Apple's iTunes Music Store. bq. When a track is selected, PC users or users with compatible handsets may then listen to a 30-second song sample and/or purchase that track, all with just a few clicks from their wireless phone. Pricing also follows the mold: songs are 99 cents and full albums cost $9.99. 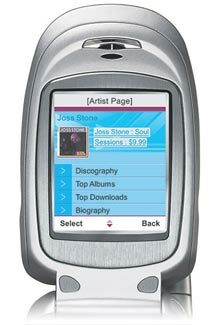 Songs can be sampled on compatible handsets: Nokia 6620, 3650, 3620, and N Gage; and Motorola MPX200.